Wall graphics can take many forms. Exterior walls can be wrapped just like a car is wrapped, even buildings with rough brick or concrete are possible to wrap with modern vinyls and techniques. Painted interior walls can be wrapped to completely change the look and feel of a space. Wall wraps can be made with a permanent adhesive vinyl, or even a removable vinyl. Painted walls can also be decaled. These range from permanent decals to temporary, removable decals. You can even buy custom removable wall graphics, that are repositionable, too (think Fatheads TM). Wall graphics are excellent ways to use unused space for selling more products, changing the atmosphere of a space, and for brand building. 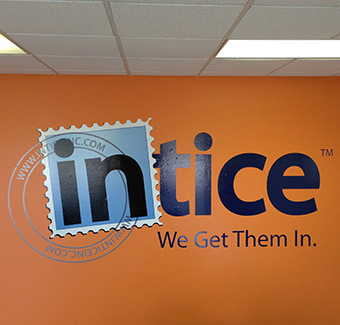 When you are considering custom wall graphics, you have quite a few choices you can make. Custom wall films are way for you to achieve a custom unique look that no one else on earth will have. There are many types of finishes and adhesives available for custom wall graphics and custom wall wraps. You can choose from a variety of finishes, whether you want your wall graphic to have a glossy finish, a matte finish, or even a textured finish. You can have your wall graphics be removable and reusable and repositionable, think Fatheads TM, but your wall graphic is custom made to whatever look you desire. When you are thinking about the interior atmospherics of your store, office, shop, or building, we can help with complete wall wraps, or even small, medium, or large-sized custom wall decals. We install wall graphics all throughout the Tampa Bay Region, and are happy to offer this service should you need your graphics professionally installed. Wall graphics, which can be considered wall signs or wall signage, are printed with modern digital techniques, allowing any colors you desire at no additional charge. If you have noticed in the pictures on this and our other website pages, we have made wall graphics out of etched vinyl, digitally printed vinyl, and even out of combinations of pre-dyed specialty gold and silver along with digital prints. We have the creativity and knowledge to give your wall graphics a unique look at a great price. Some of the specialty wall graphics we make often include graphics with unique finishes. A few popular finish for wall graphics include a dry erase over-laminate, wall graphics with graffiti-resistant over-laminate, and even metallic shimmer for unique, high-end look. When you need custom wall graphics, having a talented designer at your disposal is critical to achieving an amazing look. 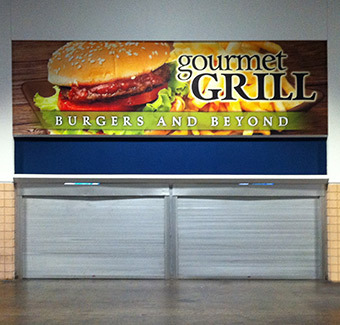 At Good Guys Signs, we have award winning designers who understand the materials, have a keen eye for aesthetic layout, and can work with you to accomplish your goals, all the while using the best wall graphic material for your budget and desired look. Wall murals can really change the look and feel of an interior or exterior space. You can have any look you desire, from a photographic print, to more cartoonish graphics, text, or anything else you desire. A custom wall mural from Good Guys Signs will be a durable, high quality addition to your space. Wall wraps can totally change the look of a building. New materials allow wall wraps to become entire building wraps. Whether your building is made of stucco, brick, concrete block, steel, or some other material, a Building wrap from Good Guys Signs can make your door swing and your drawer ring! Whether you need wall decals, wall graphics, a wall mural, a total building wrap, or some other unique wall design project, Good Guys Signs is your best bet for a great look at a fantastic price.